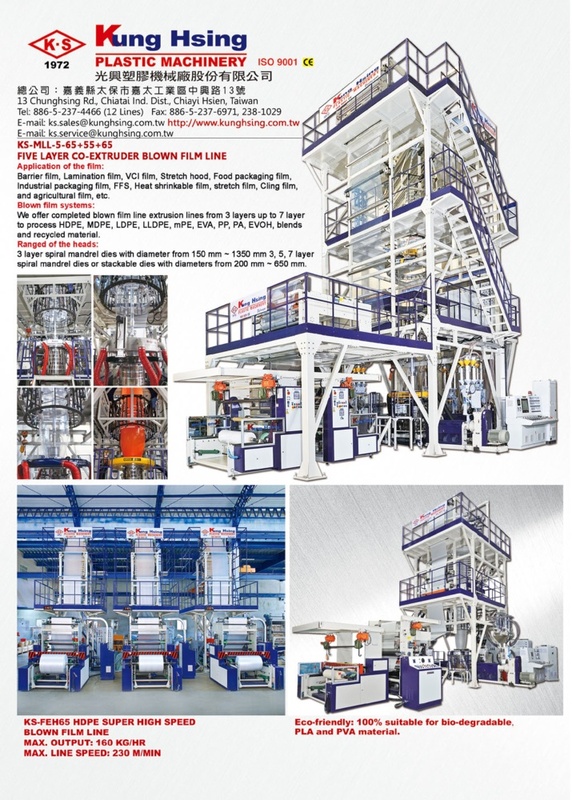 Kung Hsing Plastic Machinery Co., Ltd. was established in 1972. Mr. Chin-Lien Tsai, The President, has more than 40 years experience in the design and making of extrusion machinery. 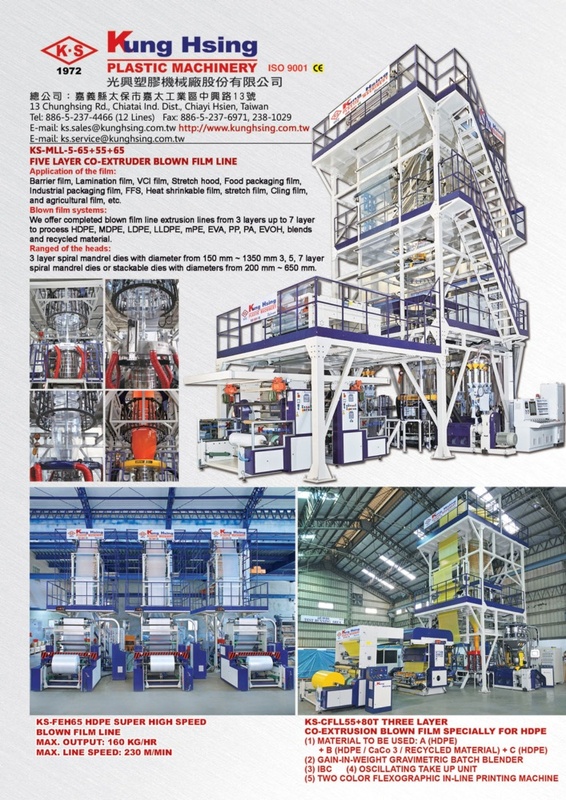 Because of President's belief, to be honest and to offer the best quality and service, "Kung Hsing" became a leader in the field of plastic extrusion in Taiwan. K.S. has two factories. The first factory is mainly for making parts and assembling; while the second factory is for Test Running, Assembling and Shipping out the machine. K.S. working team has more than 80 high skilled personnel, well experienced and responsible to promote the working performance. K.S. technical designing dept. uses the latest 3D designing software to design the most accurate parts. K.S. strategy insist on using the best material and parts to make the most durable and high performance machines. K.S. 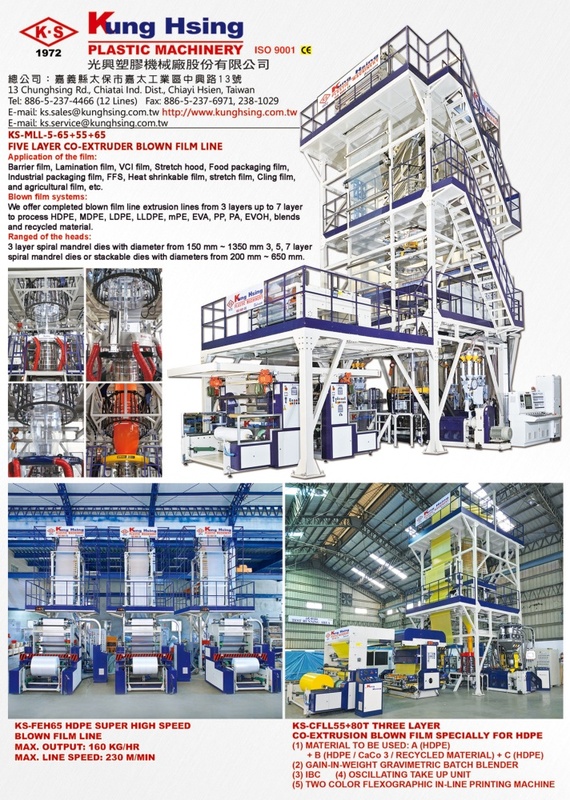 manufacture PP/PE Inflation (film blowing) making machine, Nylon/Polyester/PP/PE Monofilament making machine, PP/PE Flat Yarn (Woven Bag) making machine, PP Packing Band making machine, PP Sheet making machine, Plastic Recycling Machine, as well as special design for all extrusion system machineries and whole plant projects. K.S. became a worldwide company; have achieved ISO 9002 certificate's requirements. K.S. machinery conforms to CE standard. Moreover, every machine must pass K.S. strict and careful quality control system, and pass test running before shipping out to the customer. K.S. offer professional technology support and service to it's customer based on it's abundant expertise in manufacturing, design, and trading experience. Despite the present struggle in marketing, K.S. 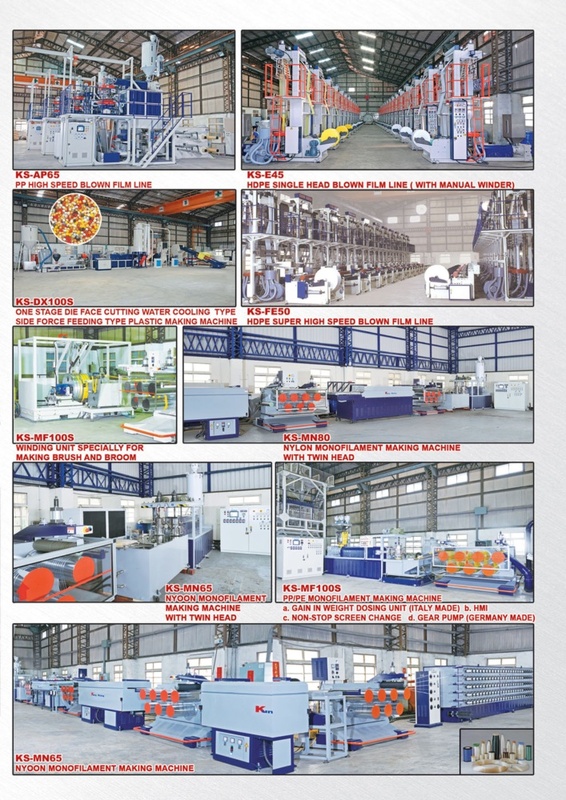 machine has been successfully sold to more than one hundred countries. Every machine has a serial number and file; that K.S. keeps it for more than twenty years. So, there will be no problem for after sale service and because of this K.S. has a very good reputation in the plastic market.